JONAH: A WHALE OF A TALE? A central message of Jonah is that God judges people by their actions/deeds/repentance and not by where they were born. This method of judgment is the model for humans (e.g. Jonah) to follow. When people line up with their nation or ethnic group irrespective of wrong or right, and practice for example "ethnic cleansing", they prove themselves skeptics of Scripture. The account of Jonah in the fish's "belly" is intended by the Bible writers to be 1iteral. The switch to Monotheism in Nineveh (Assyrian capital) has a historical basis. "And should I not pity Nineveh, that great city in which there are more than a hundred and twenty thousand persons who do not know their right hand from their left…?" Some skeptics call it "a fishy story" and others "a whale of a tale." What about it, could the events of the book of Jonah be historical? A century ago many critics sought the origin of Jonah and the fish in Greek and Assyrian mythology. The Greeks, for example, told of a girl named Andromeda who was rescued from a sea monster by a fellow named Perseus. Another girl, a Trojan princess named Hesione was rescued from a different sea monster by Hercules. (Cheyne & Black 1914) Nowadays such comparisons of Jonah with non-Jewish mythology have been discarded. Nevertheless, most scholars still do not accept the Jonah story as historical fact. The biblica1 story of Jonah and the whale was repeated in Australian waters in 1820 when a crewman from the American whaler Essex was lost overboard from a harpoon boat. Two hours later, as the whale was being stripped of its blubber, the crew noticed movement and slit open the mammal's stomach. A common approach is to view the story of Jonah as an allegory or "midrash" – a fiction which teaches a moral lesson. Jonah, in this approach, might have represented the narrow minded Jews whose concept of God was as a Jewish God. One lesson from God's mercy, in the story, to the Assyrians is the universal Fatherhood of God. From such universal Fatherhood it would follow that God regards and treats all peoples not just Jews, impartially - even the Assyrians of Nineveh. This moral lesson is therefore similar to that of the "Good Samaritan" in the New Testament, which teaches among other things that to distinguish people along moral lines – by their good or evil conduct – is more important than the distinction of nationality. That the Jonah account was intended as history rather than allegory is the more obvious conclusion. Jonah is classed among the "Prophets" and all the other prophets of the Bible are presented in the Bible as literal persons. Furthermore, Jonah is named, his father is named, the town where they lived is named (2 Kings 14:25) and the period in which they lived is given. In other words the times places and characters are not vague and unspecified as they are in, say, the parables spoken by Jesus. The degree of detail associated with Jonah would anywhere in the Bible indicate that the writer is presenting alleged history and not parable or allegory. The main intent behind the book might still be to give a moral lesson – but it's a moral lesson based on events which are offered as real. Let's consider then whether most of the report can, sensibly, be taken as literal history. Nineteenth century critics often argued that whales have too small a gullet to admit a human. Whales are divided into two main groups–baleen whale and toothed whales. Baleen whales have numerous horny plates suspended from the upper jaw which are used for straining out tiny sea creatures. The biggest baleen whale is the Blue Whale which weighs as much as 25 elephants. Blue Whales, however, have a small gullet and rarely swallow anything larger than a penguin. "Many people asked me if the Bible story of Jonah is true. Could a man be swallowed by a whale? So I pushed my body partly down the throat of a dead sixty foot sperm whale. I could just squeeze through. A fat man couldn't have made it." He [the mate] told me that, when dying, the cachelot always ejected the contents of his stomach, which were invariably composed of such masses as we saw before us; that he believed the stuff to be portions of big cuttle-fish, bitten off by the whale for the purpose of swallowing, but he wasn't sure. Anyhow, I could haul this piece alongside now, if I liked, and see. Wondering at the indifference shown by this officer of forty years' whaling experience to such a wonderful fact, I thanked him, and, sticking the boat-hook into the lump, drew it alongside. It was at once evident that it was a massive fragment of cuttle-fish–tentacle or arm–as thick as a stout man's body…"
A natural historian of repute relates, "In 1758 in stormy weather a sailor fell overboard from a frigate in the Mediterranean. A shark was close by, which, as he was swimming and crying for help took him in his wide throat, so that he forthwith disappeared. Other sailors had leapt into the sloop, to help their comrade, while yet swimming; the captain had a gun which stood on the deck discharged at the fish, which struck it so, that it cast out the sailor which it had in its throat, who was taken up, alive and little injured, by the sloop which had now come up. The fish was harpooned, taken up on the frigate, and dried. The captain made a present of the fish to the sailor who, by God's Providence, had been so wonderfully preserved. The sailor went round Europe exhibiting it. He came to Franconia, and it was publicly exhibited here in Erlangen, as also at Nurnberg and other places. The dried fish was delineated. It was 20 feet long and, with expanded fins, nine feet wide and weighed 3924 pounds. From all this, it is probable that this was the fish of Jonah." Another creature large enough to swallow a man is the voracious White Shark Carcharius vulgaris which grows to ten metres. This shark often swallows its meal without chewing and it occurs in the Mediterranean Sea – where Jonah allegedly was swallowed. The Sperm Whale occurs there too and anciently there was a Phoenician whaling industry based at the port of Joppa where Jonah embarked on the ship. Nineteenth century scholar E B Pusey (1886) cited examples of people found, dead in the stomachs of White Sharks. In one instance a stomach contained a reindeer without horns. In another was a horse. A reasonable speculation–if the story is true–would be that the "fish" which swallowed Jonah was a Sperm Whale which later became stranded in shallow water. The blood temperature of a whale is about the same as a human's blood – 37 degrees centigrade. Inside the stomach it might be several degrees warmer. In addition there is the problem of digestive juices–would they have killed Jonah and digested him? A scientific answer seems unavailable. Would digestive juices with their digestive enzymes, for example, cease to flow if the whale were near death? Possibly the acidity of the stomach juices would also be unpleasant unless their secretion were also inhibited. It shouldn't be too hard to do an experiment of placing a hand or finger in lemon juice, cola, or vinegar for varying intervals and seeing if any damage occurs. Would there be breathable air in the stomach? Macloskie (1942) argued that the whale has to expel superfluous water from its mouth after receiving food. In the process a creature trapped in the mouth might reach the laryngeal pouch below the larynx. The pouch is big enough to hold a human who would, in addition, use the whale's own air supply and have no worries about digestive juices. The Bible phrase "belly of the fish" should not count against this hypothesis since ancient peoples did not distinguish as many internal organs as we do today. In other words the entire front (=ventral surface) of a fish or whale might be referred to as the "belly". Nowadays whales are classified as mammals. However, the phrase "great fish" would have been accurate enough and more understandable for a, mainly, rural audience which didn't differentiate many sea creatures. For a brief period a person could survive in a whale's stomach. In Jonah's case the account says "three days and three nights". Some commentators argue that this means 72 hours. Others argue that the Jews counted part of a day or night as one day. If Jonah, for example, was swallowed an hour before sunrise then the previous night and the previous day-time would be included in the calculation. Jonah's total time in the "fish" would then be as little as approximately 30 hours. This would still be twice as long as James Bartley. Bartley came out bleached to a ghastly white and his skin never fully recovered from this condition. Jonah was extremely stressed by his experience. He was near death. (2:6-7) Inside the "fish" Jonah prayed. (See chapter 2) The words of the prayer were in the past tense. From this some commentators conclude that a future writer composed the prayer and the whole story is mythical. Another explanation for the use of the past tense is that Jonah was quoting the Psalms – which Jews and Christians often do during prayer. Jonah selected Psalms which had phrases appropriate to his experience. These were 120:1; 130:3; 42:7; 31:22; 69:1-2; 30: 3; 142: 2-3; 18:6; 31:6; 50:14. Of course Jonah would have written these things down later and not while in the "belly of the fish". "Eighteenth-century scientists had little knowledge of the topography of the ocean floors. They lived at a time when depth measurements were made by letting down a lead weight on the end of a rope. Not only was this method time consuming, but in the open ocean it was virtually impossible to prevent error from lateral drifting of the weight, or the ship, or both. As a result of these problems, only a limited number of soundings were made except in bays and offshore areas where such information was vital for safe navigation. Oceanographers interpreted the few measurements available as indicating that the ocean floors were monotonous flat plains. With the advent of continuous topographic profiles from echo-sounding devices, it was shown that the ocean floors are as irregular as the surface of the continents. Beneath the waves lay canyons deeper than the Grand Canyon, and mountain systems more magnificent than the Rockies." I don't imagine that Jonah saw the "roots of the mountains" in the Mediterranean Sea by peeking out of the mouth of the fish. Perhaps he guessed; perhaps he was "inspired". At any rate he got it right. "Here it should be noted that the Hebrew idiom, ‘three days and three nights,' only requires a Portion of the first and third days." Sperm whales, with their two stomachs, large throat, and biting jaw equipped with large teeth, have well documented appetites. Sharks ten to twelve feet long appear to be swallowed as easily as Jonah was! Three undigested, ten-foot sharks were found at one time in a large bull Sperm whale's stomach at Naden Harbour. Squid measuring over thirty feet long, and several hundred pounds in weight, were also found, nearly intact, in a forty-five foot Sperm whale's stomach. "The title of largest confirmed man-eater on earth must surely go to this thirty-foot long member of the dolphin family, the black and white grampus or killer whale, Orcinus orca. It could, if it ever had the opportunity, eat a couple of dozen men in one Session. Eschricht records one which was found with thirteen porpoises and fourteen seals in its stomach–it had choked on the fifteenth seal. A killer whale was once shot off the United States west coast and found to have eighteen fur seals in its stomach, each one heavier and bulkier than a man. According to an oriental method of reckoning, parts of days are included in a total of days as if they were full days. Thus in idiomatic Hebrew, as in Jonah 1:17, and in the Jewish manner of speech, as in Matthew 12:40, ‘three days and three nights' means merely one full day and parts of two others. On this matter read 1 Samuel 30:11-13; compare Esther 4:16 with 5:1; and see Tobit 3:12-13 in the Lutheran text." A major discussion on Jonah occurred in the Princeton Theological Review October 1927 and October 1928. Ambrose John Wilson of Oxford, England, cited a whaling station manager that the skeleton of a shark sixteen feet long had been found in a whale. Wilson wrote that the temperature inside a whale is 104-106° Fahrenheit (about 41o Centigrade) and that the gastric juice would be unpleasant but not deadly. He alleged that a man named Marshall Jenkins was swallowed by a whale in 1771. Critics sometimes argue that the alleged repentance of the people of Nineveh capital of the Assyrian Empire would have been a bigger miracle than Jonah surviving being swallowed by a "fish". Assyria was one of the most barbaric of ancient empires. People of captured cities were routinely burned alive, skinned alive, or had ears, noses, hands or feet chopped off. Jonah was already a prophet during the reign of King Jeroboam of Israel. (2 Kings 14:23) Jeroboam reigned 787 to 747 BC. This places Jonah after Shalmanezer III of Assyria who during his blood-stained reign, 859 - 824 BC, led 32 war campaigns. It also puts Jonah before the equally bloody Tiglath Pileser III who ruled 745-727 BC. Jonah therefore lived when a number of comparatively weak kings ruled Assyria. Among the gods of Nineveh were Ninua the goddess of waters, Oannes a god with the head and body of a fish attached to the top of a human head, Dagon god of the sea, and Anu the highest or chief god. We therefore have a setting in which the population of Nineveh might have listened to Jonah and turned to – at least superficially – the God Jonah proclaimed. So far no Assyrian record about Jonah has been found. However, there did at least once occur a swing toward Monotheism. King Adad Nirari III ruled 810-782 BC. During the first five years of his reign his mother, Queen Semiramis, was co-regent and did the governing because her son was too young. Adad Nirari's effective rule therefore began about 806 BC. It was about this time that the swing toward Monotheism took place. If Jonah was involved in this then the response to his preaching was probably superficial since history records little or nothing more about it. The circumference of the walls of Nineveh around 800 BC was about three kilometres. This increased to 12 kilometres about 700 BC. The statement that Nineveh was ‘three days' journey in breadth" (Jonah 3:3) has therefore been criticised as another reason for thinking the whole story mythical. Possibly, however, the "three days' journey in breadth" includes the villages and farmlands beyond the walls and also the outer fortifications involving three rivers and a mountain chain. We could also speculate that the phrases "three day's journey" and "a day's journey" had a meaning in Nineveh which we are unaware of. My attempt to take the story of Jonah literally and assess whether it could have happened has led to indefinite conclusions. Certainly credibility is stretched. However, the events are not wholly impossible even if we leave out notions of miraculous intervention by God which of course a scientific search has to do. We should not, however, forget the moral lesson of Jonah. This lesson is that God is the God of all peoples and he judges impartially. Therefore our moral judgements should likewise be along moral lines – based on what the person does – and not along tribal or national lines. The basis for judging a person is his behavior and not his place of birth. Every time there is a war or race riot or inter-family squabble with all participants lining up according to nation, ethnic group or family irrespective of who's morally right and who's morally wrong the lessons of Jonah (and Revelation 20) are being ignored. Ancient Joppa - the port where Jonah boarded the ship which led him to the "great fish" - had the skeleton of a 12-metre whale on display in one of its temples. In 58 BC Marcus Scaurus, a Roman official, transferred the skeleton to Rome. This incident gets a mention in the writings of the Roman writer Pliny (23 - 79 AD). It is not known when or how the skeleton got to Joppa. Is there perhaps a connection with the "whale of a tale" about Jonah? The author of JONAH: A WHALE OF A TALE (Investigator March 1994) attempted to justify that the book of Jonah in the Old Testament is historical. My research, however, shows that the Book of Jonah is clearly fictional. The fictional aspect of the book is mainly demonstrated in its anachronisms and its highly fanciful supernatural events. The story of the great fish which can swallow a man alive and vomit him out still alive (Jonah 1:17; 2:10) could have been drawn from folklore or legend and is to be found in classical literature. In the Heracleid, Hercules was swallowed by a whale and at precisely the same place Joppa, and he too remained in the whale's belly for three days. In Persian folklore Jamshyd the hero was swallowed by a sea monster that later vomited him out safely on shore. There is a Greek myth in which Arion, the musician, was thrown overboard for causing a storm, but was saved by a dolphin. In the Samadeva Bhatta of India Saktadeva was swallowed by a fish and later stepped out unharmed when it was opened. Vishnu the Avatar is shown rising from the mouth of a fish. Jonah's father is called Amittai (Jonah 1:1) which is a derivation of Amriti the Hindu "water of life". The name Jonah was also common in ancient races. The Persians had Jawnah, the Basques Jawna, the Chaldeans Ionn or Jonn. Nineveh is treated as "that great city" (Jonah 1:2; 4:11) the capital of the Assyria Empire. It was indeed a great city when Judah, under Manasseh, was an Assyrian tributary. However, the real Jonah was active around 780 BC at which time Nineveh was in decay. The use of the past tense (Jonah 3:3) indicates that the book was written long after 612 BC when Nineveh was destroyed. Assyrian and Biblical records leave no room for a conversion of Nineveh to worship Yahweh. The repentance of all of Nineveh from the king downwards, in sackcloth and fasting, is nowhere recorded in secular history. To say that the conversion was "superficial" or "temporary" completely negates the point of the story which is a didactic fiction or parable. The title "king of Nineveh" (Jonah 3:6) does not appear in Assyrian or Biblical records. It is always "king of Ashur". The story of the gourd (Jonah 4:6-7) springing up at an unnaturally fast rate and then being eaten up by a worm the next day is supernatural. I will address Mr Kotwall's points progressively. A story or report is not false just because it includes unusual, even supernatural events. We need to test as much of the report as is testable and then decide. Jonah's "wish for death" is not necessarily modelled on Elijah. The Bible mentions many who wanted to die. None of them need be seen as modelled on any other, unless this is specifically stated. A name having a meaning or having counterparts in other languages does not make a report with that name false. Hundreds of Bible names had meanings. David perhaps meant "Chieftain". Amittai, the father of Jonah, meant "faithful" or "true". Nineveh was a "great city" for centuries. Even during the half century of unrest and violence after 800 BC (compare Jonah 3 6-9) Nineveh was a major centre of Assyrian power. History records a "swing to Monotheism" in Nineveh which I mentioned. This "swing" evidently petered out. It may or may not be the conversion of Nineveh recorded in Jonah. Perhaps the people were predisposed to religious change (in addition to reasons given in INVESTIGATOR 35) by plagues in 765 BC and 759 BC plus by a solar eclipse in 763 BC. The 120,000 of Nineveh were not children. The Hebrew "adam" means "man" or "men". (Wigram 5th edition) The word occurs also in Jonah 3:7, 8 and about 600 times in the Old Testament. Usually "adam" excludes children. (1 Kings 8:39; Psalm 45:2; 145:12) Sometimes context indicates that women are included and then we can translate it as "persons", "people", "human beings" or "adults" depending on the context. The phrase "do not know their right hand from their left" should then be taken in a moral and spiritual sense. The ratio of children to adults in Assyria was about 5:8. (Garner 1976 September p.125) From 120,000 adults we calculate 75,000 children giving a total population for Nineveh of 195,000. Felix Jones surveyed the walls of Nineveh in 1834. The inner circumference was 12km within which, he believed, 175,000 people could have lived. Nineveh, however, was over twice as big, 750 hectares, although much space was devoted to temples, buildings and monuments. Jonah's population figure, then, seems quite close to modern estimates! The words "king of Nineveh" need not be a problem. If the king dwelt in Nineveh at the time why not call him "king of Nineveh"? "The Sperm Whale…comes into the Mediterranean and is recorded from time to time off the Palestine coast." Doubtless this was more true in ancient times before the slaughter of Sperm Whales in the Atlantic from the 1850s to the 1930s. The "gourd story" currently defies a natural explanation. Agreed. Regarding the quote from Neil: I demonstrated that the Jonah account was not intended as a parable (No. 35 p. 16) but as real events to illustrate moral principles. Finally, don't forget the moral lessons of "Jonah" which I presented previously. Wigram, W D n.d. Fifth edition. Englishman's Hebrew and Chaldee Concordance of the Old Testament Bagster & Sons Britain pp. 17-20. In Investigator No. 35 Anonymous argued that the Book of Jonah was intended as literal history written to advocate moral principles and that the events in the book really happened. My response in INSTIGATOR No. 37 showed that the book of Jonah is fictional to which Anonymous gave a 2-page reply. I will now treat briefly most of the points presented by Anonymous in No. 37. "Historians have no record on tablets or stelae of the conversion of the Ninevites en masse (3:5); nor has archaeological research revealed any Assyrian king called ‘the king of Nineveh' (3:6) In the days of Sennacherib the circuit of Nineveh's walls measured c 8m. (cf. 3:3) The narrative fails to tell what language Jonah used to make his message intelligible to the Ninevites. Anonymous relies on a Hebrew idiom to claim that the "three days and three nights" of Jonah in the fish's belly was only about 30 hours. My source for sperm whales not being found in the Mediterranean was the prolific genius and scholar Issac Asimov in Asimov's Guide to the Bible (1981 edition p. 647). I am not aware of the scholarship of Animals of Bible Lands cited by Anonymous to show sperm whales sometimes reach the Palestine coast. I fully agree that there are great moral lessons in the Book of Jonah. But my research does not allow me to swallow the whale! Among the famous swallow stories of the world are the Greek myths of Cronus who swallowed his own children, and of Zeus who swallowed Metis, the story of Jonah swallowed by the whale, the Teutonic Odin swallowed by the wolf, etc." In INVESTIGATOR 35 I concluded: "My attempt to take the story of Jonah literally and assess whether it could have happened has led to indefinite conclusions." I added that credibility is stretched but that most of the events might have occurred even without miraculous intervention by any God. Mr Kotwall apparently wants to reduce my argument for a possibility or probability to an impossibility. If something fictitious is presented as a true report, then the claim that it is a true report is false. My first article (No. 35) showed Jonah was intended as history – but history to illustrate moral principles. "The men of Nineveh will arise at the judgement with this generation and condemn it; for they repented at the preaching of Jonah." This link to the doctrine of the resurrection demonstrates that Jonah was understood as history. Mr Kotwall's quoting of The New Catholic Encyclopedia to suggest the contrary is misplaced. The question then remains: "Could the events in the book of Jonah have happened?" That was discussed in INVESTIGATOR 35 and Mr Kotwall's counter arguments have done little more than restate his opposition while ignoring my evidence. "In reality the nobles and courtiers with whom he (the king) was surrounded, as well as the governors whom he appointed to administer the conquered lands, often made decisions for him. Their ambitions and intrigues were a constant menace to the life of the Assyrian ruler. Palace revolts and revolutions were not uncommon, especially toward the end of the reign of a king, when the selection of a successor became a crucial issue." In addition to my explanation that the phrase "king of Nineveh" was not being used as a title but merely denoted where the King of Assyria stayed at the time, we also have the possibility that the "king of Nineveh" was not the King of Assyria but a governor in rebellion. The story of Jonah is set sometime in the 50-year period (c.800 BC to c.750 BC) when Assyria was in decline. Mr Kotwall's mistake is to seek definite answers from indefinite data. The date of Jonah's final composition is a subsidiary question. The past tense in "Nineveh was an exceedingly great city", understood bysome to suggest Nineveh no longer existed when Jonah was written, could instead imply that Nineveh was even greater at the time of writing than at the time of the events. Or perhaps both these interpretations of "was" are wrong and the correct explanation is that the entire Jonah report was written in the past tense! Again Mr Kotwall has sought to conclude from indefinite evidence that Jonah, if taken as historical, is certainly wrong. Aramaic words occur in other Old Testament books besides Jonah and are a separate issue. The 120,000 were not children as I clearly argued in No. 37. Quoting a series of mistaken "authorities" does not alter the obvious. I showed that "adam" means "men" or "adults" and in the Bible excludes children. A check of 13 Bible translations revealed two which say "infants" or "children" but eleven which say "persons" "human beings" "people" etc. The "adam" of chapter 4 are the same "adam" who repented in chapter 3. I showed in INVESTIGATOR 37 that this accurate understanding of the 120,000 agrees with modern estimates of Nineveh's population. The phrase "three days and three nights" is taken literally by a minority who wish to argue that Jesus died on Thursday rather than on Friday. Most conclude the phrase was "idiomatic Hebrew" (Schulze 1965), which meant "part of three natural days" (Poole 1963) and could be "32 to 34 hours". (Wedderspoon 1931) This would, however, require a separate debate. My quote "The Sperm Whale…comes into the Mediterranean and is recorded from time to time off the Palestine coast" was from C S Cansdale (1970) – Animals of Bible Lands. Mr Kotwall's counter quote from Asimov is also correct in that only occasional stray Sperm Whales enter the Mediterranean. "The ‘great fish' could not have been what we understand by a whale, from the small capacity of its throat. Whales though now extinct there, were in ancient times known in the Mediterranean." The idea of the Sperm Whale's small throat was a common 19th century objection which was refuted in the 20th century as shown in INVESTIGATOR 35. Did all of Nineveh repent and worship Jonah's god? I discussed the probability of this in No. 35. My quotation from The New Catholic Encyclopedia which questions that Jonah was intended as history, although Jesus referred to Jonah (Matthew 12:38-41), is called "misplaced" by Anonymous. Misplaced by whom and in what way? I thought I was spot on! I am not sure what the Funk and Wagnalls quotation is supposed to prove. It appears irrelevant to the context. On what basis does Anonymous conjecture that "the king of Nineveh" was not the King but a governor in rebellion? What scholarly support or evidence is there for presuming that "Nineveh was even greater at the time of writing (the book of Jonah) than at the time of the events?" That the 120,000 referred to children is deduced by scholars from Hebrew idiom as I have already clearly demonstrated. Most translations endeavour to be faithful to the original language, and it is acceptable, even correct, to translate as "persons", "humans", etc, the Hebrew word here involved. But scholars of Hebrew are able to recognize an idiom when they come across it in the Scriptures and this is often clarified in reliable Commentaries, Dictionaries, and related works on the Bible. I have not found any Bible translation which renders the "three days and three nights" of Jonah 1:17 as "30 hours" or as "part of three natural days" as Anonymous maintains. Anonymous casually dismisses Moffat's Translation, The Companion Bible, and the Dictionary of the Bible by J L Mckenzie, as "mistaken authorities"! The Companion Bible is a world-famous publication and has been a useful and comprehensive tool as in the hands of Bible readers and scholars for many years. Accuracy and sound judgment as a Biblical theologian. Time Magazine. Simply amazing…an honest and outspoken scholar. Journal of Biblical Literature. "there are Christians today who take the Bible literally, believing the earth was created in six days, Elijah was taken up to heaven in a fiery chariot, Jonah was swallowed by a whale, and Jesus physical body arose from a tomb. For these believers, Christian myths are true stories not to be questioned but to be taken as literal fact. But the vast majority of thinking people are not easily satisfied with this simplistic approach. For them myth contains much that goes against common every day experience, science and reason. We knew that earth was not created days, people do not fly to heaven in a fiery chariot, whales do not swallow people and later dislodge them, and the dead do not come out of their tombs alive." Mr Kotwall seems to believe that to quote a "scholar" and a positive review is enough to establish a conclusion. The Companion Bible is, as Mr Kotwall says, "world famous". If quoting it is enough to prove a point why doesn't he quote p. 1247 where it is argued that Jonah is literal valid history? The marginal comments and appendixes of The Companion Bible include many errors. In INVESTIGATOR 20, for example, I discussed the failed prophecy in Appendix 531. Scholars do not write only what everyone knows to be true. In a large publication such as a Bible translation or a Bible dictionary the scholar will include many educated guesses when deciding on points which are inconclusive and many such opinions will later turn out mistaken. Existence of "rave reviews" does not mean the raving reviewers checked and confirmed every statement involving an educated opinion. If they did then we could avoid the work of the scholar and go straight to the more informed work of the raving reviewer. When anyone supplies information which a scholar did not consider when giving an opinion then the new information should be considered and scholarly opinion set aside if necessary. Josephus (Antiquities Book 9 chapter 10) repeats the story of Jonah, also not as an allegory but as history (or alleged history). I don't "presume" Nineveh was even greater at the time of writing." This is merely one of several interpretations of "was" in "Nineveh was a great city". The most probable explanation is that "was" is used because the entire account is in the past tense. The 120,000 are called "adam" meaning "man" or "men" a word sometimes including women. The Bible never refers to baby girls or baby boys as "men" which Mr Kotwall wants to maintain. His confusion arose because the 120,000 "cannot discern between their right hand and their left band". (4:11) The Bible sometimes uses right and left to represent good and evil or favour and disfavour. Jonah lacked Jewish follow-up to teach the 120,000 adults and so they would have remained in a state of spiritual ignorance despite their conversion. Mr Kotwall persists in viewing the 120,000 "men" as literal babies because the correct explanation gives a population figure for Nineveh which agrees with modern estimates. (INVESTIGATOR 37) Who of us, without going to a library, can accurately give the population of, say, 19th century Berlin, Tokyo or Glascow? For Jonah to get it right adds plausibility to the account! I didn't claim any Bible renders "three days and three nights" as "30 hours". I cited scholars who believed about 30 hours was meant. The same words "three days and three nights" are used of Jesus' time in the tomb–late Friday afternoon to pre dawn Sunday. "Three days and three nights" is therefore not literal but idiomatic. The account I gave in INVESTIGATOR 35 argued for the possibility that the events in Jonah happened and I presented facts and scenarios which added credibility to Jonah. Mr Kotwall might still be correct in rejecting Jonah as history but the reasons he has given are not conclusive. Anonymous feels that reviewers are not to be trusted, that Encyclopedias could contain faulty logic and scholars arc not really reliable and make "many educated guesses". Since that is so, whom do we turn to for reliable interpretation and analysis of complex historical and Biblical matters? Also by the same logic the "scholars" quoted by Anonymous should be discounted. So what are we left with? "Educated guesses" from Anonymous and myself? The Companion Bible was not the only commentary which I quoted for support. There were several other sources I had quoted. Moffat's, McKenzie, Asimov, Interpreter's, etc. I suppose Anonymous considers all these as also wrong, or mistaken, or using faulty logic. Why refer to Josephus' writings? He lived in the first century and people of Jesus' time did believe Jonah to be historical. In fact many writers of 19th and early 20th century believed the same. It's only the enlightened modern scholars who have challenged this and other fundamentalist beliefs. As regards the rest of the contents of Anonymous' last article I have adequately dealt with the items raised, in my previous submissions. Further comments would result in somewhat of a rehash of what I already stated. The article in Investigator No.40 on Fundamentalism by Dr Potter is excellent and also relevant. Referring to our debate on "Jonah" Mr Kotwall states: "Anonymous feels…Encyclopedias could contain faulty logic and scholars are not really reliable." I certainly did not imply so general a principle. In several specific instances where authorities were wrong I explained why and how. In every discipline scholars make "educated guesses" in areas where there is still controversy – and may then be refuted by others. This is not limited to theology. Mr Kotwall asks: "Why refer to Josephus' writings?" The reason was to show that ancient Jews viewed Jonah as describing events which supposedly happened. The book of Jonah itself indicates it's not an allegory, but intended as factual, which I pointed out in INVESTIGATOR 35. My investigation was in two steps. Firstly I asked whether Jonah was presented as history. The answer was "Yes" and so the 2nd step was to examine whether the events could have happened. Doubtless more evidence will come to hand in future. Mr Kotwall is aware of some of my other investigations where Bible statements believed wrong were proven right in the 1960s, 1970s or 1980s. I refer to Anonymous' letter in INVESTIGATOR No. 42. It appears that Anonymous maintains that scholars and encyclopedias could contain faulty logic and could be wrong but nevertheless he quotes them freely. Apparently those references quoted by him have to be taken as reliable whereas those quoted by me would have to be wrong! I agree that so-called "educated guesses" are often resorted to when a controversy exists. I have maintained that there is no real controversy existing among modern-day reliable and informed scholars about "Jonah" being fictional. There is near unanimity on it. Josephus made very useful contributions as a historian, but his works also contain many errors. (The Unauthorized Version, Robin Lane Fox, 1991) I have already stated in my previous submission why it was inappropriate to use Josephus as a reference in this subject. 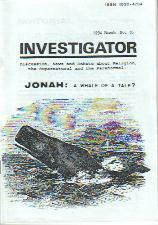 My investigations indicate that Jonah was not history and as such the events related in Jonah could not have happened. This was fully discussed by me in previous copies of INVESTIGATOR. Anonymous' research indicated to the contrary to him. It is for the readers of this magazine to decide which arguments appear more plausible. Finally, to depend upon and hope for yet undiscovered evidence to support or bolster a theory is not good exegesis! When I quoted scholars of one persuasion rather than another I gave extra reasons for my choice. I did not merely ask that: "references quoted by him have to be taken as reliable whereas those quoted by me have to be wrong." A further distinction when quoting a reference is whether the quote refers to something objective which others can check empirically or whether the quote is the scholar's opinion and cannot be independently confirmed. In a controversial question it is not enough to merely quote someone who shares your prejudice. Is there "near unanimity" that Jonah is fictional? Perhaps among "liberal" scholars seeking to "demythologize" the Bible. However, there is also "near unanimity" of Jonah's accuracy among thousands of religious ministers who have university or seminary degrees and so are also "scholars". A controversial question is not, however, settled by taking a census of opinion! Why Josephus should be wrong in stating what Jews of his time believed is for Mr Kotwall to explain. If there are reasons for concluding that all 1st century Jews thought the Jonah book allegorical we should be given those reasons. I have shown that Jonah was intended as history to illustrate moral lessons. And if the presentation of real events was intended then the obvious question is: "Were the events indeed real; did they happen?" Finally, I invite Mr Kotwall to read my article: "Investigating Scientifically, whether God Tells Lies" in INVESTIGATOR 31. I would rather depend upon renowned and reliable scholarship than suppositions and guesses from Anonymous. To me "if' and "maybe" and "probably" and "usually" are not enough to accept the premises of Anonymous. If some theory flies in the face of reason, logic and common sense, then I would not entertain it. I do not consider it sacrilegious to say that the Bible does contain myths, fictional accounts, as well as facts and eternal truths. Obviously, there is expected to be unanimity among "thousands" of ministers, who hold degrees from seminaries, on Jonah being factual and other fundamentalist beliefs, because if the ministers did not uphold the fundamentalist opinions of such parochial seminaries, they would not probably get their "degrees"! Such degrees are not worth the paper they are printed upon. I have known such ministers who hold D.D.s but could not read a word of Hebrews or Greek, but nevertheless revelled in their own tendentiousness! I will, though, sit up and listen to distinguished scholars who possess qualifications from accredited universities, who are or were appointed lecturers and professors at such universities, who have significantly published articles and books in the field through renowned periodicals and publishing houses, and who are acknowledged, without reservation, as authorities in their area of expertise. These are the scholars who have been referred to by me in my articles on Jonah. When taking sides in a controversial issue it's not enough to quote "renowned scholarship", reject contrary evidence and assume the case is closed. It's easy to quote top astronomers who believe alien civilizations exist and easy to quote the opposite. If you take sides, don't just give the quote according to your bias, but give reason for your choice! In INVESTIGATOR 40 p. 50 I wrote: "When anyone supplies information which a scholar did not consider when giving an opinion then the new information should be considered and scholarly opinion set aside if necessary." Any person who ignores these self-evident guidelines and instead claims a vague ability to judge relative values of academic degrees or which scholarship is "reliable scholarship" should give proof of such ability. Even if he could judge the value of academic degrees the use a person puts his degree to is something else again. Neither degrees, qualifications or experience assure accuracy when evidence is inconclusive. In INVESTIGATOR 28 the Bible plus myself were shown correct on the question of whether the crocodile has a tongue and a curator of reptiles, and a crocodile hunter and various authors were all wrong! In vast numbers of issues and questions that's all we can establish–a possibility or probability. We can't change the possibility to certainty by citing a scholarly opinion any more than we can predict roulette results by watching where the world's top mathematician places his bets. Some critics argue for Jonah as "myth"by claiming Jonah got wrong the population figure for Nineveh. I'll go through this question again, keeping in mind the guidelines above. Jonah 4:11 mentions 120,000 "adam" in Nineveh. A few scholars say these 120,000 mean children or infants which implies a total population of about 1 million. This is vastly higher than estimates made by modern researchers of Nineveh's population. Which is right and reliable and why? The Old Testament has the word "adam" in the Hebrew about 600 times. It's easy to get all 600 from the Englishman's Hebrew and Chaldee Concordance. "Adam" nearly always refers to adult males but may sometimes include females. I found no example of "adam" referring to infants or even including them. Note, I'm not just citing majority "scholarship" (14 Bibles against 2) but giving extra reasons! a) The word "adam" also occurs in Jonah 3:3-10 and there the king commands every "adam" to repent and "turn from his evil way." It's not males alone who are evil. b) If men only were meant there are alternative Hebrew words such as "ish" = man/men/husband. "Ish" occurs about 1,000 times in the Old Testament. c) Another word "enosh" which means "mortal" or "mortal man" occurs about 500 times. It also mostly refers to male adults but may include women. "Enosh" occurs in Jonah 1:10, 13, 16; 3:5. In 3:5 enosh refers to people who "believed God". This would not have been males alone. In other words Jonah is concerned with adults, male & female, who repented and believed. Take this literally and it means infants. However, the Bible sometimes uses left and right to represent evil and good or disfavour and favour. In Jonah 4:11 this figure of speech would describe the spiritual ignorance and vulnerability of the 120,000 new believers. Citing a few "scholars" who made the mistake of taking a vivid figure of speech literally is an inadequate response to the preceding evidence. In English we don't usually call children "persons" or include them among "persons". We can, but it is not usual. On this basis it's possible that the seven translators who translated "adam" as persons agree with my analysis that adults, male and female, are meant! For example, if the translation says 120,000 "men", we'd double this to include women then multiply by 13/8 to get the total population of 390,000. From my analysis that "adam" in Jonah 4 means adults – males and females – we calculate 195,000. Felix Jones surveyed the walls of Nineveh in 1834. The inner circumference was 12 km within which, he believed, 175,000 people could have lived. Double these estimates to allow for Nineveh being about twice the size and we have very good agreement with the 195,000 for Nineveh calculated from using the most reasonable interpretation of "adam" in the book of Jonah. Who of us can accurately give the population of 18th century Baghdad, Berlin or Bombay? For Jonah to get the figure correct for Nineveh provokes thought and adds credibility to the book. The close population fit is only one evidence. In INVESTIGATOR 35 there is much more. To overcome the evidence for the "possibility" critics need to do better than quote opinions even the opinions of a few scholars. "Some sharks also have a curious digestive system which allows them to store food for long periods in their stomachs without breaking it down. One tiger shark kept two intact dolphins in its stomach for over a month. Sharks can also regurgitate the entire contents of their stomachs at will." It should be noted that the 2 dolphins were dead. Even if a human survived being swallowed he'd still have the problem of lack of air to breathe. Thanks for putting more ANONYMOUS pieces on your website and tell him I find them to be faith building and well written. If ANONYMOUS could revise the Jonah piece on the website should he feel the one criticism to be valid it would be much appreciated as I would like to pass his info on so it could be widely distributed like I did with the hyrax piece. I was suspicious of the James Bartley, "modern Jonah", story when I used it in the Jonah debate commencing in Investigator 35. My oldest reference to Bartley was A Dictionary of the Bible (1902) and that reference cited a German church magazine of 1895! Investigator published the Dictionary extract with my comment – "Observe the strange original reference…" but this is omitted in the website version of the Jonah debate. I had no means of checking the Bartley story further, but did see it in non-religious publications, and therefore used it. There are other stories of people swallowed by a whale or shark and surviving. My initial Jonah article cited Australasian Post (December 3, 1988) regarding a man lost overboard from a harpoon boat of the whaler Essex in 1820 and retrieved from a whale's stomach after two hours. Such stories are less detailed than the Bartley story and therefore probably dubious. Although it's useful to be able to point to a "modern Jonah" when discussing the Biblical Jonah it's better to desist for the present. The origin and effects of lies and liars is actually a theme in the Bible – from the first lie in Genesis 3 to the punishment of all liars in Revelation 21:8. What's wrong with lies is the harm they do. If James Bartley, for example, was a hoax then millions of people wasted their time over it and anyone who thinks the Bible is unreliable may feel he has added reason to think that way. Anonymous was a good starting point in my investigation on Jonah and I borrowed liberally to compose my own essay. The 24 page booklet The First Jaws by Chick Publication tells of a British sailor swallowed by a "gigantic Rhinodon shark" in the English Channel "in the early 1800s" and being cut out 48 hours later. I discuss hoaxes in my essay and the miraculous. I do not dismiss a whole area of study because of hoaxes. Hoaxes have happened on both sides of the materialist/Christian fence – for example the Piltdown man. I do lean, however, on the survival of Jonah being miraculous but I investigate naturalistic explanations in my essay.